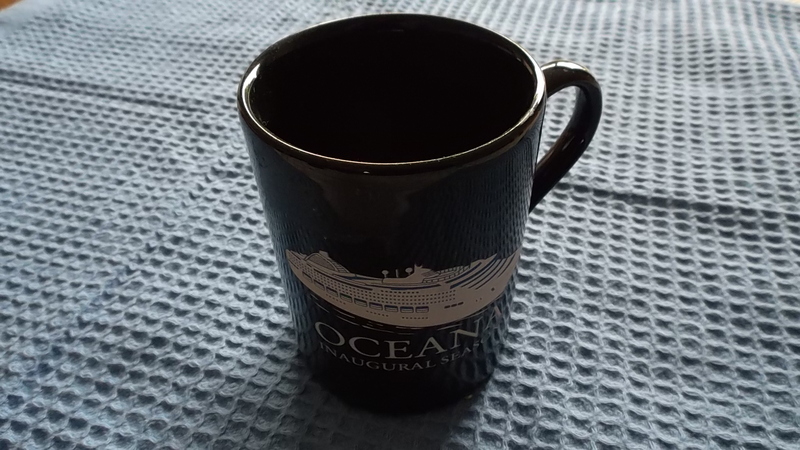 DESCRIPTION -- From the P&O Line shipping company vessel the Oceana and the vessel's inaugural season at sea, several souvenir items were produced and this item is one of them being a souvenir drinking mug. The item shows on the front a picture of the vessel and the name (click on the picture for a closer view of the item). HISTORY -- MV Oceana (previously Ocean Princess), is a cruise ship of the P&O Cruises fleet. The ship was built by Fincantieri at their shipyard in Monfalcone, Italy. At 77,000 tonnes, Oceana is the fourth largest of seven ships currently in service with P&O Cruises. She entered service with the company in November 2002 and was named by HRH the Princess Royal in 2003. Oceana is sister ship to Sea Princess, which also served in the P&O Cruises fleet as Adonia between 2003 and 2005. 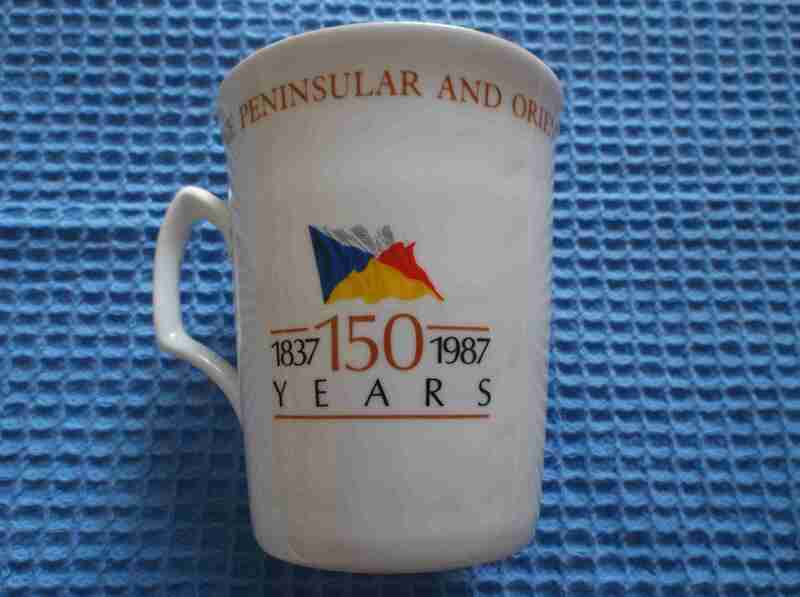 DESCRIPTION -- Anniversary drinking mug which was produced for the Peninsular and Oriental Steam Navigation Company (known as the P&O Line). It celebrates the 150th anniversary of the shipping company from 1837'1987 and the item is in a great condition (click on the picture to see a view of the other side of the mug). 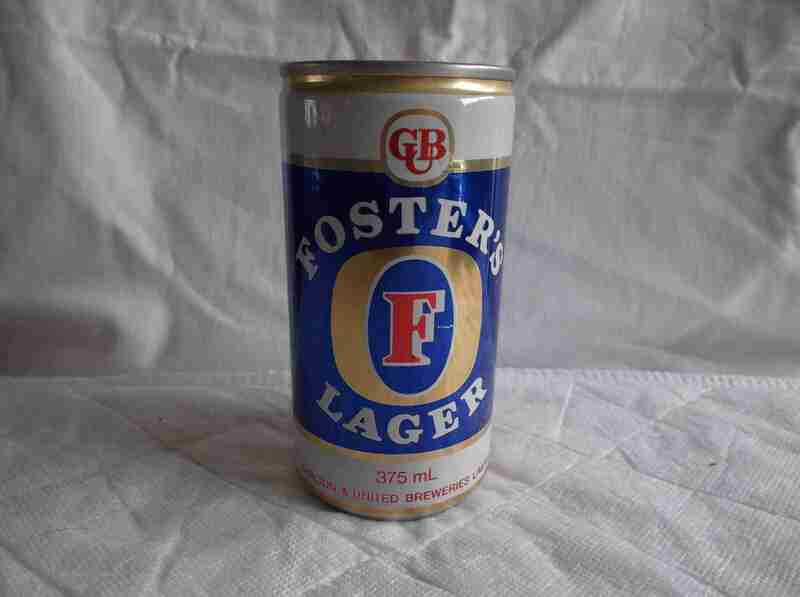 DESCRIPTION -- From the P&O Line vessel the Oriana a can of unopened Fosters Larger produced to celebrate the last ever voyage of the vessel. 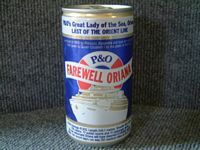 HISTORY -- Originally resplendent with her owners' traditional corn coloured hull, Oriana appeared as an Orient Line ship until 1966, when that company was fully absorbed into the P&O group. Faced with unprofitable around the world passenger routes, the P&O white hulled Oriana was operated as a full-time cruise ship from 1973. Between 1981 and her retirement from service five years later, Oriana was based at Sydney, Australia, operating to Pacific Ocean and South-East Asian ports. DESCRIPTION -- From the P&O Line shipping company this is an early souvenir compass design paper weight which is in an excellent condition and a genuine article from the company. DESCRIPTION -- From the P&O Line shipping company and dating from the 1960's this is an original in service waiters serving dish which may be silver-plated and is made by Mappin and Webb Ltd (P&O Line providers). It is bottom marked P&O with crest and is 6ÃƒÂ¢Ã¢â€šÂ¬Ã‚Â³ (15cm) wide and is in a good condition (click on the picture to see the P&O markings). DESCRIPTION -- From the P&O Line shipping company this is from the famous 'War Commissioned' cruise ship the SS Canberra and dates from the 1960's. It is a solid pewter tankard which shows on the front the company houseflag and the size is 4ÃƒÂ¢Ã¢â€šÂ¬Ã‚Â³ (10cm) high. Also included with the item is a set of 4 paper coasters showing on them the Canberra name. All are in fairly good condition with the tankard having suffered a couple of knocks and slight dents but are all original from the vessel. HISTORY -- SS Canberra was an ocean liner, which later operated on cruises, in the P&O fleet from 1961 to 1997. She was built at the Harland and Wolff shipyard in Belfast, Northern Ireland at a cost of 17,000,000. The ship was named on 17 March 1958, after the federal capital of Australia, Canberra. She was launched on 16 March 1960, sponsored by Dame Pattie Menzies, GBE, wife of the then Prime Minister of Australia, Robert Menzies. She entered service in May 1961, and took her maiden voyage starting in June. During the 1982 Falklands War, she served as a troop ship. DESCRIPTION -- From the P&O vessel the SS Canberra this is a glass dish which shows in the centre a full colour picture of the ship at sea and is 4ÃƒÂ¢Ã¢â€šÂ¬Ã‚Â³ x 3ÃƒÂ¢Ã¢â€šÂ¬Ã‚Â³ (12cm x 9cm) and in a great condition. HISTORY -- SS Canberra was an ocean liner, which later operated on cruises, in the P&O fleet from 1961 to 1997. She was built at the Harland and Wolff shipyard in Belfast, Northern Ireland at a cost of 17,000,000. The ship was named on 17 March 1958, after the federal capital of Australia, Canberra. She was launched on 16 March 1960, sponsored by Dame Pattie Menzies, GBE, wife of the then Prime Minister of Australia, Robert Menzies. She entered service in May 1961, and took her maiden voyage starting in June. DESCRIPTION -- Original early example lounge ashtray from the P&O Line shipping company which is in a fantastic condition and one of the early styles to be used on board a cruise ship. DESCRIPTION -- One of the most famous of P&O vessels is the SS Canberra and this item is a book covering the memories of the grand old vessel and containing many pictures and stories and contains over 40 pages. Also included is a Canberra on-board Pocket Guide and both items are in a fantastic condition. DESCRIPTION -- Original as used on board dining plate from the P&O Shipping Line which has the traditional distinctive coloured circle pattern to its edge and is 9" (24cm) wide and dating from the 1960's and is in a fantastic condition (click on the picture for a view of the P&O logo on reverse of plate). HISTORY -- The Peninsular and Oriental Steam Navigation Company (P&O) has a celebrated history dating back to the 1830s. It was incorporated by a Royal Charter in 1840, and its name therefore includes neither "PLC" nor "Limited". The initials "P&O" are among the most familiar anywhere, and its house flag, older even than the Company itself, is one of the best known.